Bangalore: TRIO World School has won Jury award in the Category – Innovation in Information and Communication Technology (ICSE) at the recently concluded ‘Parentof Innovation Awards’. Amid great pride and honour, Parentof in association with ASSOCHAM presented the ‘Parentof Innovation Awards’, India’s largest parent-school study that aims to recognize extraordinary commitment by schools towards 360-degree student growth and development of students. Schools across Karnataka participated in the Parentof Innovation Awards by submitting their nominations. Shri Vajubhai Vala, the Hon’ble Governor of Karnataka, inaugurated the celebration with the lighting of the lamp and felicitated the winning schools. The Parentof Innovation Awards 2017 aimed to applaud the innovative initiatives & Best Practices adopted by schools. Over 150 schools from CBSE, ICSE, SSLC boards and government schools, from different zones of Bangalore submitted their nominations for the Awards. Over 15000 parents participated in the study. The schools were judged on five categories that included innovations in parent engagement, student health & safety, co-curricular development, information & communication technology, and innovation in inculcating value education. 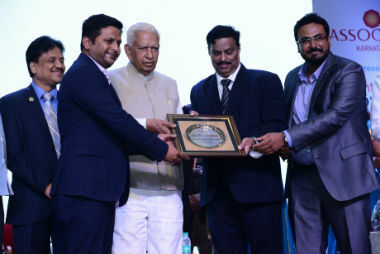 Stressing on the importance of education, the Hon’ble Governor of Karnataka, Shri Vajubhai Vala said that opportunities should be given to children to excel in all fields. Addressing the gathering at the Parentof Innovation Awards 2017, the Governor also stressed on the need for such initiatives that will uplift the marginalized and give voice to the needy, enabling every woman and child to lead a life of dignity. He also emphasized on support structures that will aid in providing quality education for every single child. Shri R. Shivakumar, Chairman, ASSOCHAM Karnataka Council expressed his happiness that ASSOCHAM partnered with Parentof in pursuit of excellence and Innovation in Primary and Secondary Education. He applauded the scientific methodology adopted to recognize Innovation in Education. Mr. Swaroop Madhavan, President, Karnataka Startups Forum,Founder & MD – Parentof.com in his address reiterated the need for Innovation in the Education sector for the country to move forward. The talk emphasized the need for research into practices adopted by schools, to analyse the efficiency of pedagogies that have evolved with time. The speech also addressed how parenting behavior has changed over the years, and how Parentof provides tech-enabled solutions that drive better outcomes for children. “We have continuously enhanced student learning by effectively and innovatively integrating technology into our curriculum, thereby promoting collaborating learning. We, at TRIO have adopted a more student-centered approach based on inquiry, communication and meaningful learning. We wanted to stimulate their interests and provide them with first-hand experience by promoting ‘learning by doing’ method. To support us in our 21st Century education, we have implemented a one-to-one iPad environment in the classroom which brings education to life” said Mr. Naveen K M, Managing Director, TRIO World School.